And 6 Other Health Risks Associated With Alcohol Abuse. New studies are pinpointing the causes of muscle weakness in those who suffer from long term alcoholism. It seems that heavy alcohol consumption, especially over several years, affects the cells themselves and specifically their ability to self repair. Mitochondria are the centers of cell repair and heavy alcohol use directly affects their functioning. The genes involved in this specific type of repair and subsequent muscle regeneration are unable to function properly. The result is the loss of muscle strength observed in many patients with a history of heavy alcohol consumption. What does this new study funded by the National Institutes Of Health mean for the future of alcohol treatment? According to the director of the study, it can provide new insights into developing better medications to treat the condition. Heavy alcohol intake has been shown to reduce the number of red blood cells that are vital in carrying oxygen throughout the body. The resulting anemia causes several unpleasant symptoms including fatigue, shallow breathing, and dizzy spells. By changing diet to include more foods that contain iron, taking supplements, and getting effective treatment for alcoholism, the condition can be successfully treated. Heavy drinking increases the risk of developing several types of cancer, including but not limited to mouth, throat, larynx, esophagus, liver, breast, and colon cancers. The reason researchers believe contributes to this increased risk involves the body’s process of converting alcohol. The body converts it to acetaldehyde, a potent carcinogen. The risk of developing cancer increases even more when an alcohol abuser uses nicotine as well. Heavy consumption of alcohol and binge drinking is a direct cause of blood clots which can in turn lead to a heart attack or stroke. Recent studies have shown that binge drinking doubles the chances of death among people who have already suffered from a heart attack. Cardiomyopathy is another deadly condition worsened by drinking. With this condition, the heart muscle weakens and can eventually fail altogether. Heart rhythm abnormalities are also associated with this condition and can include atrial and ventricular fibrillation. These conditions can cause stroke, loss of consciousness, and even death if immediate treatment is not received. One of the most commonly known conditions associated with alcoholism, cirrhosis is the heavy scarring of the liver caused by heavy consumption of alcohol. Alcohol in high amounts is toxic to the liver and can cause the scarring which makes it impossible for the liver to function properly. 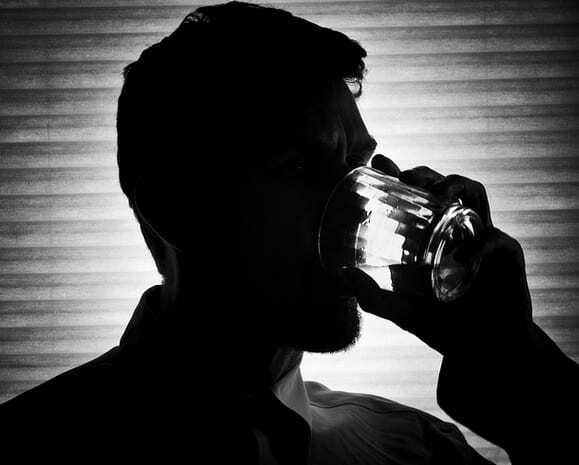 Some alcoholics develop cirrhosis, while others don’t and researchers are still not sure why. Women who are alcoholics seem to be more susceptible. Normal brain shrinkage occurs with age and at a gradual pace of about 1.9% every 10 or so years. Heavy drinking accelerates this shrinkage in regions of the brain associated with memory and cognitive functions. The result is early symptoms of dementia such as the ability to plan, make apt judgements, problem solving, and other important cognitive abilities that allow us to function everyday. In addition to brain shrinkage that contributes to early dementia, heavy drinking also contributes to nutritional deficiencies that can cause dementia symptoms as well. Whether a person began drinking to treat depression or if they developed depression symptoms later on is difficult to pinpoint, but the fact remains that the two conditions often go hand in hand.